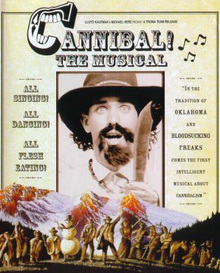 Trey Parker's ("South Park") Cannibal! The Musical is a western/horror/cannibal/comedy/musical. There are not many of those out there, folks. And certainly none so many that still manages to be a hilarious must-see despite its heavy, heavy flaws. 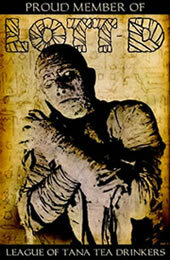 The film kicks off with a hilarious cannibalism sequence that pokes fun at all the best cannibal films of the genre. The effects were made to be purposely ultra-low budget to add to the comedy. Fans of Cannibal Holocaust and Cannibal Ferox and the like should find this sequence very amusing, as well as anyone else who enjoys a good mock-gore scene now and then. The script generally grinds to a halt after that, but that is no matter at all. That may seem to be slightly contradictory, and for any other writer it would be. However, Trey Parker is a hilarious writer with an extremely unique talent of making absolutely nothing be insanely intriguing. In fact, this film is the very definition of “you don’t need to go forward if you like The View.” Nothing at all happens in the script for the first 45 minutes or so, but the viewer is never bored because there are witty songs, many bizarre one-liners, and a squirting-eye Cyclops to keep them occupied until he decides to get on with the plot. And speaking of plot, there actually is one, and a fairly decent one at that. Parker is often criticized for writing “silly, plotless, raunchy” drivel, when only the raunchiness is true. Cannibal! does, surprisingly, have a point hidden beneath songs that have words like “shpedoinkle” in them; the problem is that the plot only gets cooking in the last half of the film. But rest assured, this is only a technical problem that diehard film buffs who are only concerned with “the perfect film” would point out. From a typical movie watcher’s point of view, this choppiness can be all but disregarded. There is significant overacting, but much like Russ Meyer’s film, this is more of an intentional style than a defect. And it really just adds to the cheesiness and campiness of the whole experience. Cannibal! blends the best parts of horror, camp, and comedy and serves it up on a musical platter. Even though it was almost done filming before Troma got its hands on it, this film is the quintessential example of the Troma style. It is a film with fresh humor, a unique twist to horror, and never fails to defy any and all genre limits. I could go on about amateur screen shots, poor cuts, and very obvious continuity issues, but this is a film that you just don’t care. And if you do care, it’s probably not for you. The whole driving point of the film is the witty dialogue, the funny, funny songs, and the gory spoofs. Do yourself a favor and pick up the DVD. The director’s commentary manages to be even more hilarious than the film, and trust me, this is something you’ll want to see more than once. Cannibal! is one of those few trainwrecks of a gem that essentially throws its middle finger up at any form of standards of cinematic merit, but manages to be so raw, and so fresh that it actually gains some merit of its own.